It is impossible to have high levels of insulin in your system while burning fat at the same time. Think about that. If you eat a meal that has too high of a Glycemic Index, your blood sugar will spike, causing a large release in insulin. During this period of time your body cannot use fat for fuel (even if you are operating under a calorie deficit and even if you workout like crazy). You can get everything else right and not make good progress if you allow your insulin levels to get out of whack. A while back I used to think that as long as you burned more calories than what you ingested, you would lose weight. This is true to a point…you should lose weight under a calorie deficit. The problem lies in the fact that if you eat a high G.I. carb, you may shut down the body’s ability to burn fat for several hours. Even if you do wind up losing weight, you aren’t following the quickest route to your goal. You probably know what insulin is, but if you don’t here is a quick summary: Insulin is a hormone that causes most of the body’s cells to take up glucose from the blood (including liver, muscle, and fat tissue cells), storing it as glycogen in the liver and muscle, and stops use of fat as an energy source. When insulin is absent (or low), glucose is not taken up by most body cells and the body begins to use fat as an energy source. The “Glycemic Index” ranks carbohydrates according to their effect on our blood glucose levels. The rating used to go from 0 to 100…sugar being the highest GI carbohydrate. Now it goes from 0 to over 100…anything with a rating over 55 is consider a high GI. 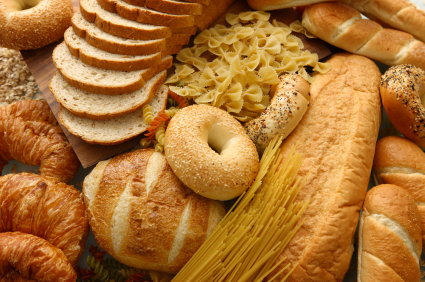 Carbs with a high GI raise blood glucose levels, which raise the release of Insulin. It is best to avoid high GI carbs when you are trying to burn body fat. For the most part, vegetables have a zero impact on blood sugar levels. The same goes with meat. One of the reasons I’m a big fan of salad made with chicken breasts is that I know it will keep my insulin levels stable. If you want to lose weight rapidly, try replacing a lot of the high GI carbs you eat with vegetables. Eating lean meat with green vegetables is a simple approach to a lean body. Now On to the Advanced Stuff About Insulin! Large Spikes in Insulin Can Cause Muscle Loss! So insulin turns OFF the fat burning switch and turns ON the fat storage switch. This is bad enough, but it can also cause you to lose lean muscle. Here is how…when insulin brings down the blood sugar levels often times it “over-corrects” by causing low blood sugar. The body normally combats low blood sugar by releasing energy from stored fat, but the high level of insulin will not allow this to happen. The only source of energy in this circumstance is protein. Your body will break down muscle protein when faced with this dilemma. It is a bad situation…gaining fat while at the same time losing lean muscle. Not a good deal at all! Stubborn lower body fat reacts a bit differently than the rest of a fat on a woman’s body. Many women have very lean upper bodies compared to their lower body. One of the reasons for this is that the fat on the lower part of the body is actually much more sensitive to insulin spikes than the upper body. Even the smallest increase in insulin will shut down a woman’s ability to burn fat on her lower body…What is crazy is that she still may be able to burn fat on her upper body. The best way to combat this phenomenon is to keep insulin levels as stable as possible. This has HUGE implications if you are a woman trying to burn off lower body fat! Are you ever tired mid-morning or mid-day? This is a major sign that the food you ate caused a an insulin spike that “over-corrected”…causing low blood sugar (time to gain fat and possible lose muscle…not good). Here is what I do…I eat small low GI meals for breakfast and lunch…and I eat the majority of my carbs after my afternoon workout. After a workout, your body can handle a large spike in blood sugar since your muscles are starved to a certain extent. This is a great way to eat tasty carbs without the negative side effects. Note: I have reached very low body fat levels by having a protein shake for breakfast, one for lunch, and eating a moderately high GI meal after my afternoon workout. I typically do this for 3-4 weeks straight whenever I want to get extra lean. I believe it works so well, because I don’t allow insulin to turn on the “Fat Storage” switch. Diane, you are insulin resistant and have a relatively less than normal insulin response (which is why you must take additional insulin). In other words, either your blood sugar remains too high after a meal because the cells of your body are glucose uptake impaired AND/OR you aren’t releasing enough insulin to effectively mediate blood sugar in the first place (typical Type 2). High blood sugar is your ENEMY. The non-drug solution? You must simply lower your carbohydrate intake without lowering your overall calories below what you expend daily (look up ‘TDEE calculator’ on Google to figure out how many total calories you should be eating). So, if someone has proper insulin response and their Total Daily Energy Expenditure (TDEE) is, say 2000 calories (and they don’t exercise/are fairly sedentary), they can usually MAINTAIN their weight by eating 125g of carbs (no more than 70-ish at any one meal due to liver capacity which runs from 70 to 100-ish depending on how big you are), 150g of protein (3 meals of 50g each works fine), and 100g of fat. (Notice I am NOT talking percentages — I am talking REQUIREMENTS in grams to maintain an energy balance when 2000 calories expended daily are equal to 2000 calories eaten daily) Now, since YOU are insulin resistant/deficient and knowing that carbohydrates CAUSE high blood sugar, you MUST limit your carbs below 125g daily (preferably 30g minimum-50g daily if you are trying to lose FAT at a faster rate – although at these lower carb rates you are going to lose some muscle weight due to post-absorptive gluconeogenesis). You will need to INCREASE your protein intake by the difference between the 125g of carbs you were eating before and the 30g-50g you decide to eat from now on. This will help offset the loss of muscle mass, which is what you want because the more muscle you hang on to, the more calories you can burn even at rest. The MOST IMPORTANT part of this Diane, is that when you lower your carb intake, your need for exogenous insulin (your insulin pen and other insulin-raising drugs) will GO DOWN (because your blood sugar will be lower) and you must talk with your doctor before you take on a low carb approach so he/she can LOWER your doses of exogenous insulin to the proper amounts needed for you. Over time, a low carbohydrate diet can REVERSE Type 2 diabetes (and there are many personal testimonials on the Internet to back this up — and so should your doctor if he /she is worth their salt and actual UNDERSTANDS the mechanisms here) and will help you burn all of your excess FAT weight. THEN you reach a point where you can slowly add a few more carbohydrates to your diet (while reducing your protein by the same amount) until your weight stabilizes where YOU want it to! I know you are only eating 800 calories a day, but this is called semi-starvation mode which inhibits HEALTHY fat-burning greatly (the 2 pounds a week you are losing is NOT mostly fat — IT’S mostly MUSCLE! Look up ‘gluconeogenesis’ and you’ll see what I mean!) Until you start ramping up your metabolism slowly over time to the point where you have a normal non-impaired metabolism (which is going to be maybe a couple hundred calories +/- 2000 calories daily if you are fairly sedentary), you will never reach your goals of being truly HEALTHY. Your body only NEEDS about 24-30g of carbohydrate daily PERIOD (This is approximately the only amount of glucose in the body that must come from outside the body, mainly for 20% of the glucose used for normal brain function — 80% of it can come from ketones which are products of fat-burning!). So eat more protein, eat more healthy fats, eat waaaaay less carbs, talk to your doctor before doing any of this so he can regulate your drugs — THAT’S IT! Once you have got it all under control, then you can dabble in vegan or vegetarian approaches if that floats your boat, but first things first — get your blood sugar under control through NUTRITION so you can soon reduce (and most possibly eliminate over time) your need for these diabetic drugs which only address the SYMPTOMS not the underlying PROBLEM. Wouldn’t you rather fix the problem? Otherwise, you’ll be taking these drugs for LIFE. Good luck and Good Health!! I will add one thing, because I know someone (or a lot of someones) will bring it up… The 24g-30g of glucose minimum is for mostly to fairly average sedentary individuals. If you exercise, your glucose (carbohydrate) needs WILL increase. However, this is entirely dependent on WHAT KIND of exercise you do as to how much carbohydrate you need to stay in energy balance. For example, exercising at 25% of your VO2MAX (about 96 heartbeats a minute for me), I will burn ~85% peripheral fat, ~7.5% intramuscular triglycerides, and ~7.5% carbohydrate. If I burn ~240 kcalories during one hour of this effort, only 4.5g of carbohydrate will be used (from muscle & liver glycogen stores). Exercising at a heart-pounding 85% of VO2MAX (about 165 heartbeats a minute), I will burn ~ 12.5% peripheral fat, ~12.5% intramuscular triglyceride, and 75% carbohydrate. If I burn ~413 kcalories during one hour of this effort, I will use 77.44g of carbohydrate. So YES you would need to add additional carbohydrate to your diet to fuel low and high intensity workouts respectively. This is why “80%carb/10%protein/10%fat” vegans like DurianRider and Freelea stay so lean on 3000 kcalories a day — they are both EXTREMELY active (DurianRider WAAAY more so obviously) and burn through VAST amounts of carbohydrate daily. They MUST eat this much or they will have a hypoglycemic episode and collapse from low blood sugar! That’s also why they are clearly not maintaining very much muscle (like most long-term low-protein vegans) — lots of endurance activity (like long bouts of slow cardio, bicycle marathons, etc.) increases muscle catabolism and without additional protein in the diet to help somewhat counteract this, they start to become literally emaciated (see DurianRider on YouTube [warning: MILITANT vegans] who is clearly wasting away at a much higher rate than his girlfriend Freelea because he is a constant high endurance athlete with very little protein in his diet and she is just very active and probably lifts weights or does more bodyweight type resistance exercises thereby utilizing the low protein a little better). I do the similar thing, I eat small breakfast and most of the time I even skip the breakfast and have small launch 1 – 2 hours before I hit the gym, and after gym, protein shake with Isolate then few fruits just to keep my hunger down until my big meal (chicken breast/turkey breast or beef with rice that I usually eat between 17:00 – 21:00 and it has worked great, I have been building muscles and keeping my fat % down. I am not into the bulky hulk look. I am more geared to toned James Bond Daniel Craig look as it is much more appealing and easier to maintain then bodybuilder lifestyle in my opinion. And since I am closing to the 40 year old mark, your message is what I have been adapting for the past years.